Attention current 8th-graders! Sign up now for 5 days of free fun at RMCTC Career Camp. Choose morning or afternoon sessions June 10 through June 14. Explore 5 careers in 5 days! Make and take home fun projects. Learn to work with tools and equipment used by major construction and manufacturing companies. This activity is open to current Muhlenberg and Reading school district 8th-graders who will be advancing to 9th grade in the fall. Camp will be held at RMCTC. Campers will receive lunch and transportation from central locations. There is no cost for qualified students, but space is very limited, so apply now! Registration deadline is May 24, 2019. There is no cost to qualified students. This camp is funded by the Berks County Workforce Development Board and Reading Muhlenberg Career & Technology Center. or give the forms to your 8th-grade school counselor. View or download the Career Camp flyer. RMCTC students won medals and scholarships at the PA FCCLA State Leadership Conference, March 20–22. Students from four programs earned medals and scholarships to the Culinary Institute of New York, Fashion Institute of Design & Merchandising, Indiana University of Pennsylvania, Johnson & Wales University, and Sullivan University. Culinary Arts, Gold: Fernando Gonzalez, John Weik, Leonel Mendez Castaneda; Silver: Jackson Fabre, Grace Ellen Hernandez, Christian Martinez, Aidan Campbell, Xavier Everingham, Debra Fuller, Griselda Nieto, Derrick DeJesus, Tyler Setley. Baking and Pastry Arts, Gold: Katie Ayala; Silver: Tyanna Rivera, Lizbeth Cintron, Michelle Fuentes; Bronze: Kelvin Garcia. Sewing and Clothing Manufacturing, Gold: Truc Phuong Ha; Silver: Jyara Wood, Sandra Castaneda. Early Childhood Education, Silver: Jonny Divison, Cynthia Esquivel, Johanna Salinas, Annaly Velez, Amelia Moore; Bronze: Brianna Salinas. 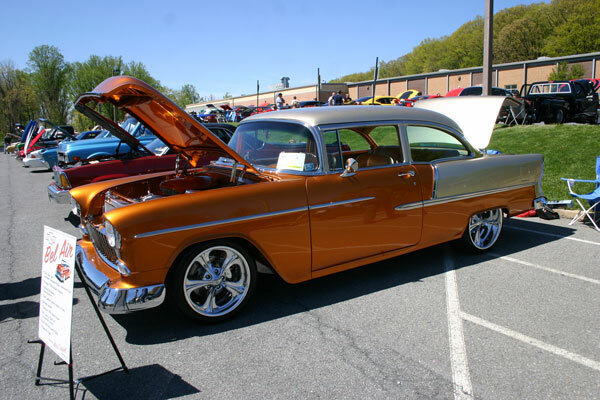 Mark your calendars for Saturday, May 4, 2019, as the day of RMCTC’s 9th Annual Car & Motorcycle Show. This rain or shine event runs from 8 a.m. to 2 p.m. and includes a pancake breakfast, flower sale, raffles, music, and more. Proceeds benefit our student organizations. More details to follow soon. 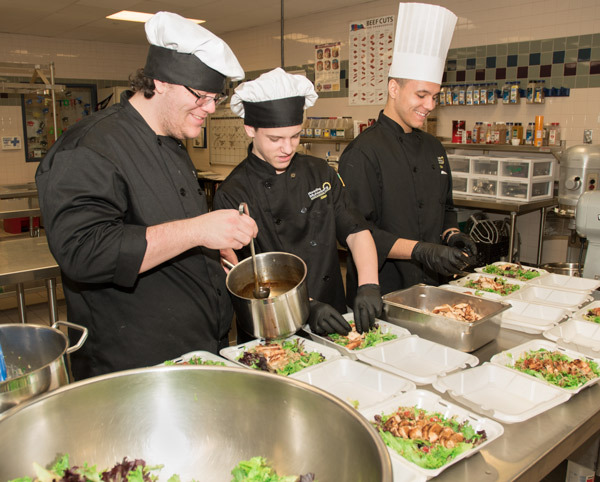 Culinary Arts students prepared quinoa chicken salads as part of an FCCLA Food Innovations competition. The project involved completing an “Indulgent Salad Dish” and surveying consumers for their feedback on ways to improve the salad. Students will then take the suggestions, remake the salads the following week and re-survey consumers on the results. with teriyaki chicken as part of a Food Innovations competition. 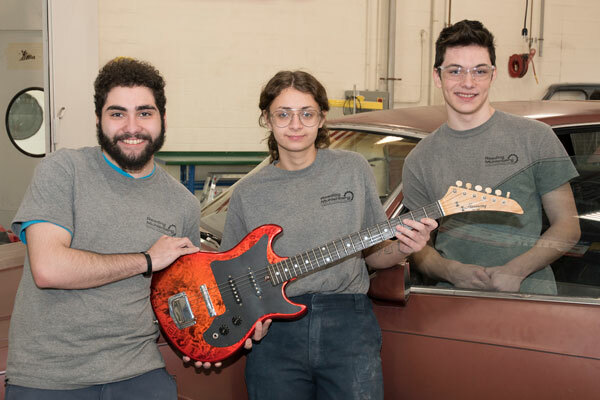 Students in Auto Body Repair expanded their repertoire to benefit the Boscov’s Berks Jazz Fest. They repaired and painted a well-used electric guitar and gave it a new, shiny, second life. Read the story here. New program in 2019! Can you guess what it will be? Do you want to be ready for an exciting career in the expanding healthcare field? Get a great start in one of RMCTC’s five Health Sciences programs, including Sports Medicine & Rehabilitation, brand-new for 2019. As the “Baby Boom” generation matures, the demand for health care climbs. Be ready to join this growing industry by choosing one of the dynamic programs in the Health Sciences cluster. RMCTC has a career for you. Explore different career fields and find a program that fits your style and goals. Get a head start on college while still in high school. 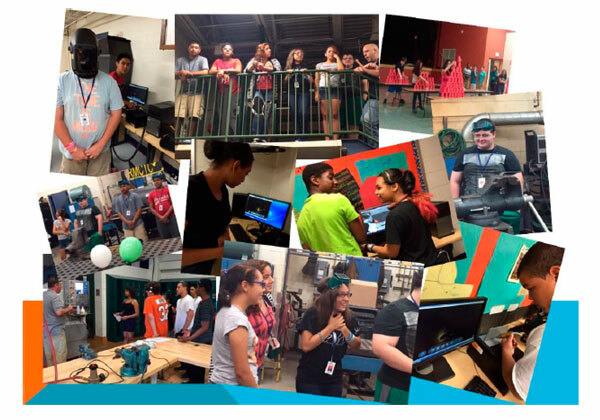 High-level skills + college credits = Technical Academy awesomeness!